If riding a horse or at least having the prospect of horse riding has always been on your mind, it’s never too late. Sign up with Jolly Guru Horse Riding School and Club to gallop, skip and more. Jolly Guru is not just a riding school but also a beautiful ranch just an hour away from Mumbai. They offer home stay, all-day horse riding opportunities and other fun activities at their ranch. However for people looking to learn horse riding don’t have to look too far as they take regular classes in Mumbai itself. 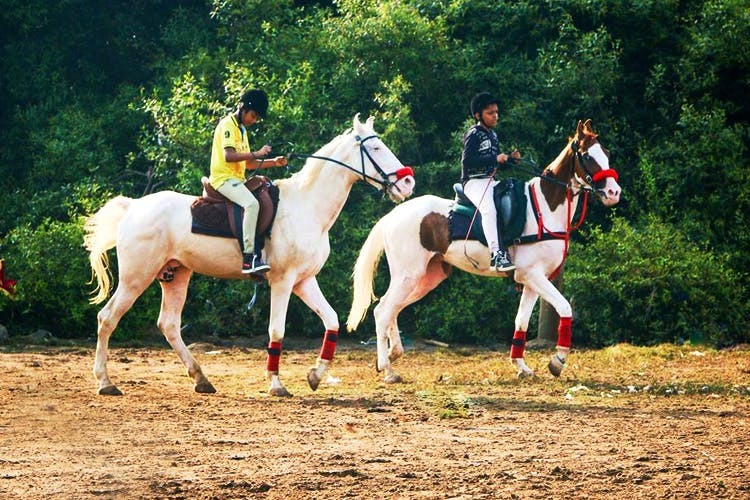 They organise the riding lessons daily at the ground near the Juhu-Versova Link road and at the Renaissance Federation Club ground. It’s open to everyone and anyone, with little or no experience. Kids needs to be above the age of 12. They have a morning batch and an evening batch, depending on what timings suit you. The horses with Jolly farms are well-trained, well-fed and well taken care of. They come from beautiful farms in and around India. They have the Marwari aka Manali breed for training purposes among other breeds. They offer basic training like mounting, dismounting, walk, extended walk, trot and canter. Once a person gets to cantering, they next step is galloping. However, due to the lack of space, they don’t teach galloping in Mumbai. Though one can get in touch with them for out of Mumbai training and getaway sessions. For INR 5,000 you get five classes in a week for one hour each. They tell us it’s easy to learn basic riding techniques within 20 days and get to the galloping stage. If you’d always wanted to learn how to ride a horse, this is your chance. Sign up for the classes and tick it off your bucket list right now. Happy Galloping!